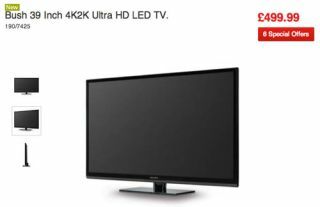 Bush 4K TV on sale in Argos for £500 | What Hi-Fi? Fancy jumping on the 4K TV bandwagon but not so keen on the big price tags? Bush and Argos may just have the answer. A 39in Bush 4K TV has gone up on the Argos website for just £500 – some £4000 cheaper than the last Ultra HD set that we reviewed (admittedly that was a much larger, 65in television, the LG 65LA970W). The twist? It's not actually available to buy yet, currently showing as 'out of stock' both online and in stores. We got in touch with Argos who confirmed that the TV shouldn't on sale yet, a spokesperson telling whathifi.com: "Unfortunately, this line has appeared early on our website in error – and there are currently no stocks available." It's not the first budget 4K TV that we've seen, with Kogan and Polaroid releasing cheap Ultra HD TVs at CES 2014. This followed the Seiki SE39UY04 4K TV, which went on sale in the US for $699 (and looks not dissimilar to the Bush model, suggesting it could be a rebadged model). Argos suggests the Bush 4K TV will have three HDMI inputs, a USB input and a smattering of legacy video connections, plus that all-important 3840 x 2160 resolution. While the knockdown price will grab plenty of peoples' attention, we'd question whether a 39in TV is anywhere near big enough to see the benefit of the increased resolution. And that's before we second-guess the quality of a Bush TV, a brand name that it's fair to say hasn't exactly been synonomous with high quality televisions in the past (budget TVs – yes). Still, increased interest in 4K on the 'high street' and an increasing number of more affordable sets should help to bring down the price of models from more established brands. Panasonic, Samsung, Sony et al., all have new TV ranges for 2014, so we look forward to seeing the prices of the new UHD TVs.